Today the media is awash with stories about how a new book is set to be published, written by Harper Lee 55 years ago, and before she wrote To Kill a Mockingbird. The newly discovered manuscript was thought to have been lost in the depths of the publishers vault. According to one news report, Harper wrote this story in the mid 1950s first, however this story, Go Set a Watchman, is set 20 years after, and is about Scout (the main character) coming back to her hometown as an adult all grown up. At the time, her editor, after reading the flashbacks of Scouts childhood in To Kill a Mockingbird, felt she should write about Scout as a young girl instead. 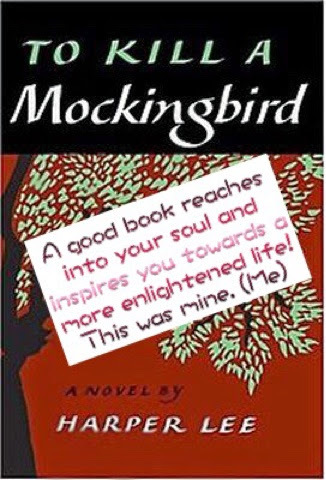 I was around 15 when I read To Kill a Mockingbird by Harper Lee, and it was the most influential and lasting thing I ever read, and learnt from, at high school. All these years later and many many books since, I can say with great conviction that this beautifully written and compelling story continues to shape how I see the world. I was fascinated with the main character Scout - so much so that I wanted to name our daughter Scout but I couldn't quite convince Technoman! Her struggles with what it is to be a girl, were foundations on my own understandings about feminism and equity. I could relate to the small town idiosyncrasies that Harper portrayed, and I was appalled by the hatred and racism I read about, hatred and racism fuelled by narrow minded ignorance. The fight for the underdog and about seeking justice underpin much of what I fervently stand for. Through its pages, I learnt about humanity, both good and evil. The quote above is a quote I live by. It helps me see through the eyes of others with empathy and understanding. An insight that is invaluable in my work as an educator. Finally, Harper Lees beautiful writing inspired me by painting a visual feast with words. Her literary prowess bought each character to life, and set my social justice and equity genes into overdrive. Whoever says that words don't have power have yet to find that one piece of writing that shapes their very foundations of being. I have great expectations for Go Set a Watchman, and already my imagination is crafting who Scout is as a 31 year old woman, wondering if she is compassionate and following in her fathers footsteps, fighting for those who need a voice. I can't wait, and despite the fact it was written 55 years ago - I have a feeling it will be worth the wait and just as relevant in todays world.